If you’re new to riding, you may not have ridden with a Breast Collar before and may not be sure why they’re so common in both English and Western disciplines. First and foremost, Breast Collars are not just a useful tool, but a crucial piece of safety equipment for both horse and rider. 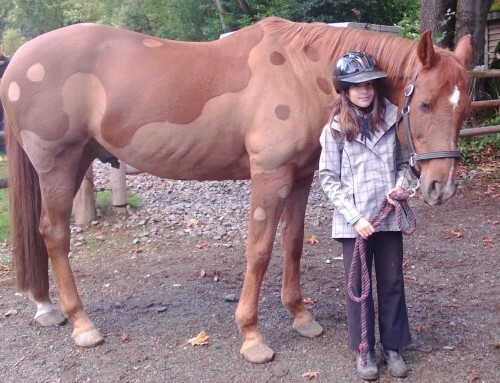 Their first job is to help keep a saddle in place. A properly fitted breast collar will keep a saddle from slipping back or to either side. 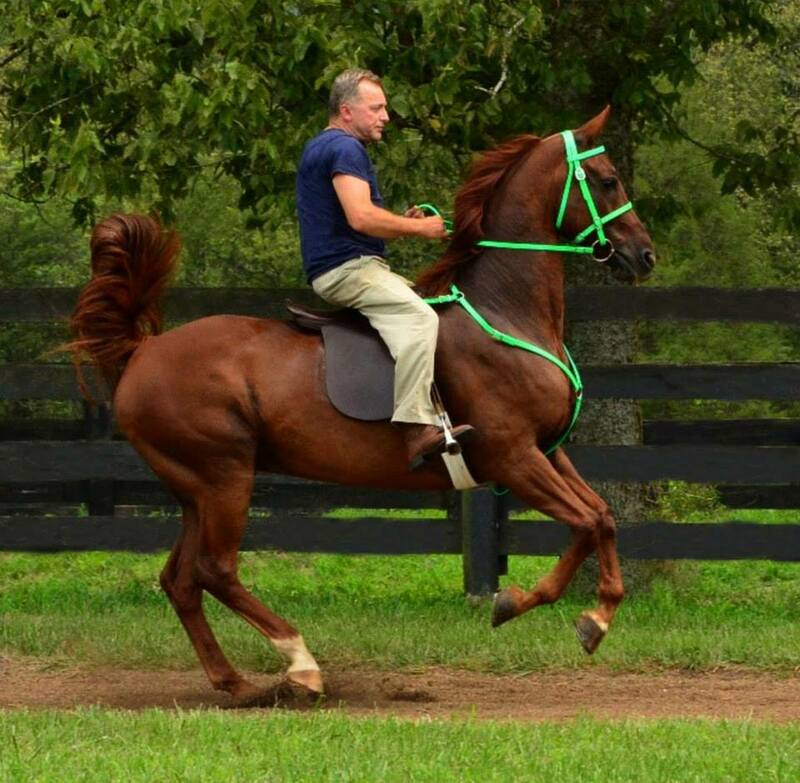 Some horses lack wither definition or are round, causing the saddle to shift around. Breast Collars also provide added peace of mind for riders of more regularly-shaped horses. It is nice to know that just in case you do not tighten your girth correctly because you are in a hurry or have a jittery steed, your saddle will not slip. Loose girths can cause saddles to slip, sometimes so much they end up under the horse’s belly–a frightening scenario that not only increases the odds of a rider falling off, but could lead to a rider’s worst nightmare – a caught foot in stirrup leather. Our breast collars help keep the rider safe as well. We feature breast collars with a over-the-wither strap that we affectionately refer to as the “Oh crap strap” (this comes standard on our English Breast Collars and can also be ordered separately if needed on our Western Breast Collars). This little handle comes in handy if your horse throws in a few, uh, unexpected bouts of air time, or if you have a few less-than-graceful moments in the saddle yourself. 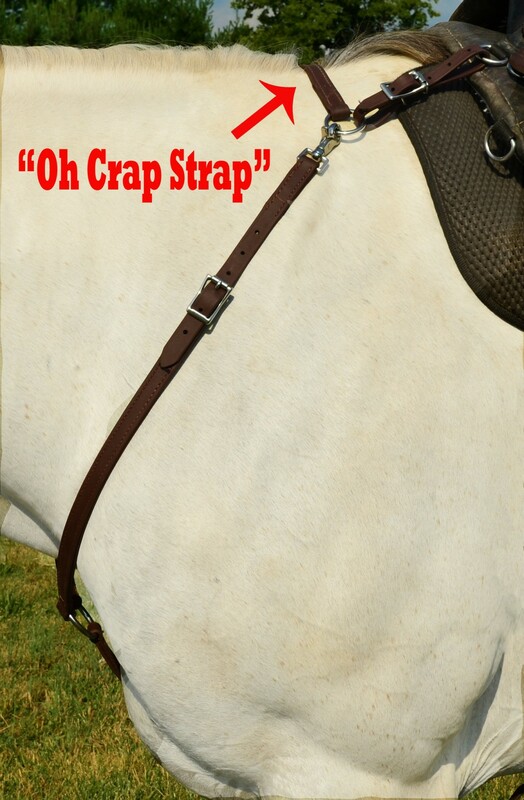 Here at Two Horse Tack, we offer both English and Western Breast Collars in leather and beta biothane. Our beta biothane pieces come in a variety of colors and bling options, and can be made to match any of our bridles. We also offer girth loops. These are a must have for english girths or any girth that lacks a dee ring to clip too. These stay on girth and are huge time saver as you do not have to thread girth through breast collar each time you tack up. Best of all, we keep our quality high and our prices low–we know how expensive good tack can be, and we’re out to make it affordable. As the weather starts turning colder here in Kentucky, we’re brainstorming ways to keep our horses limber and in shape even during messy winter weather when we can’t ride. One of our favorite things to do with horses of any discipline is a few “carrot stretches”–encouraging horses to stretch through their neck and back in certain positions in order to reach a treat. Obviously, this is also great for getting your horse limbered up before a ride or cooled off after a workout. We dug up an old article from Equus recently which has some great tips on stretching your horse out. Take a look! G’day, pony! We’ve got a few new products here at Two Horse Tack that we think you and your horses will love! We’ve recently introduced the Australian barcco bridle to our line-up. 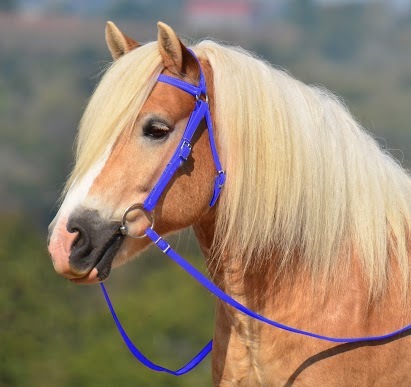 If your horse needs a sturdy bridle for work or competition without the noseband, consider the Aussie Barcoo Outrider bridle. The rugged yet elegant design lets the beauty of your horse’s head shine through while giving you all the control you need. We offer the barcco bridle in leather or beta biothane, in a range of sizes and color options. Also new to our line-up is the bitless sidepull–the best of two worlds! This bridle gives you all the freedom and control of a bitless bridle, together with the comfort of a sidepull. This must-have bridle includes a noseband and a jaw strap to provide stability and keep the cheekpiece away from the horse’s eyes. Rein rings are sewn into the noseband and triple stitched for extra security. The standard width is ¾-inch. The bitless sidepull is hand-stitched with white thread (black available at no cost on request) for a refined look. Come rain or shine, our stainless steel hardware is guaranteed not to rust (brass available on request). Available in beta biothane or leather, in a variety of sizes. As you may have noticed on our store, we’re all about dressing things up a little…turning the conventional into creative. That could be why we love those clipping contests that are circulating Facebook these days–how do these people find the time, patterns, and clipper blades to pull some of these off? And more importantly, how patient are those horses?? and this forum thread. We love the stars. Which are your favorites? Has your horse been re-decorating his or her stall with some creative ridges and ah, texturized wood? If you’re sure your horse is chewing and not cribbing, the first step is to make sure your horse’s diet isn’t lacking. Horses sometimes develop tastes for odd substances (called “pica”) that are rich in vitamins or minerals their diet is missing. We’ve noticed that as the summer grasses die out, our horses become more interested in chowing down despite those expensive diet balancers and supplements we buy them (no, we’re not sure that they aren’t working for Purina). There are several sprays on the market to stop wood chewing, but our favorite trick is a much cheaper one. 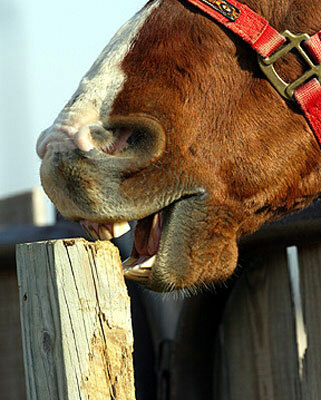 Take a bar of soap (we like Irish Spring) and rub it on the areas of the stall or fence that the horse is chewing. It won’t hurt them but they’ll rethink their choice of snack real quickly.